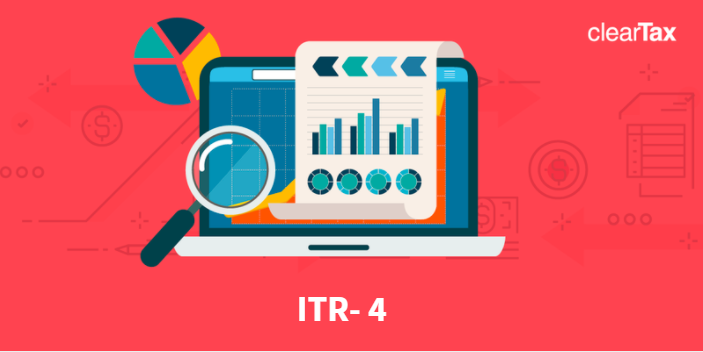 What is ITR4 Form? 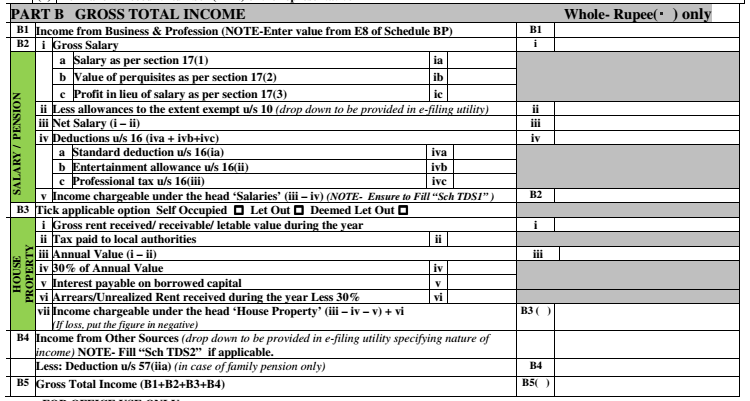 | How to fill ITR-4 Form? New ITR 4 has been notified for the AY 2019-20.ITR-4 Form is the return form for those taxpayers, who have opted for the presumptive income scheme as per Section 44AD, Section 44ADA and Section 44AE and whose income is not more than Rs 50 lakh. What is the ITR 4? Who is required to file ITR 4? Who are not required to file ITR 4 for AY 2019-20? What is the Structure of ITR 4? How do I file my ITR-4 Form? 1. What is the ITR 4? The ITR-4 Form is the Income Tax Return form for those taxpayers, who have opted for the presumptive income scheme as per Section 44AD, Section 44ADA and Section 44AE of the Income Tax Act. However, if the turnover of the business mentioned above exceeds Rs 2 crores, the taxpayer will have to file ITR-3. 2. Who is required to file ITR 4? e. Income from Other Sources having income up to Rs 50 lakh (Excluding winning from lottery and income from horse races). 1. Freelancers engaged in the above profession can also opt for this scheme if their gross receipts don’t exceed Rs 50 lakhs. 3. Who is not required to file ITR 4 for AY 2019-20? An individual having income from salary, house property or other sources above Rs 50 lakh cannot use this form. An individual who is either a director in a company and has invested in unlisted equity shares cannot use this form. 4. What is the Structure of ITR 4? *Highlights are the new changes in the form for AY 2019-20. 5. How do I file my ITR-4 Form? You can submit your ITR-4 Form either online or offline. a. Individual is of the age of 80 years or more. If you submit your ITR-4 Form electronically under digital signature, the acknowledgement will be sent to your registered email id. 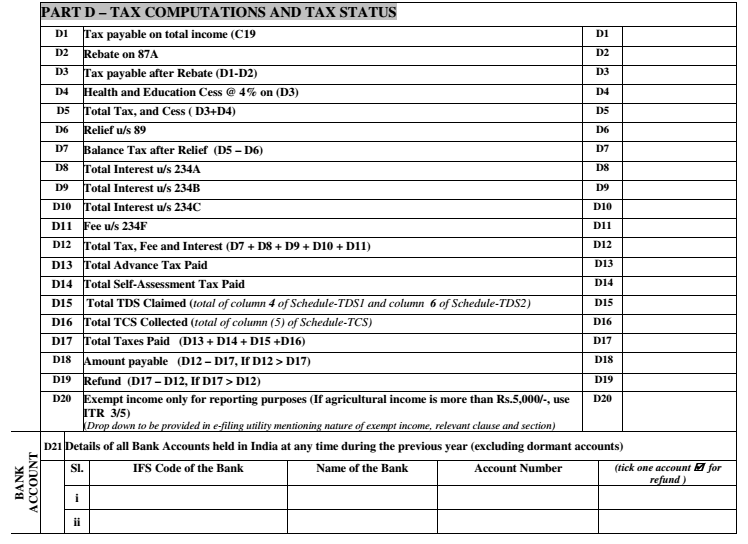 You can also choose to download it manually from the income tax website. You are then required to sign it and send it to the Income Tax Department’s CPC office in Bangalore within 120 days of e-filing. Remember that ITR-4 is an annexure-less form i.e. you do not have to attach any documents when you send it. ITR 4 form for FY 2018-19 is not applicable to an individual who is either a director of a company or has invested in unlisted equity shares. Under Part A, ‘Pensioners’ checkbox has been introduced under the ‘Nature of employment’ section. Return filed under section has been segregated between normal filing and filed in response to notices. Deductions under salary will be bifurcated into standard deduction, entertainment allowance and professional tax. 80G Deduction: Amount of Donation is bifurcated into cash and other mode. Separate Business details like Name of business, business code, description for section 44AD, 44ADA & 44AE. 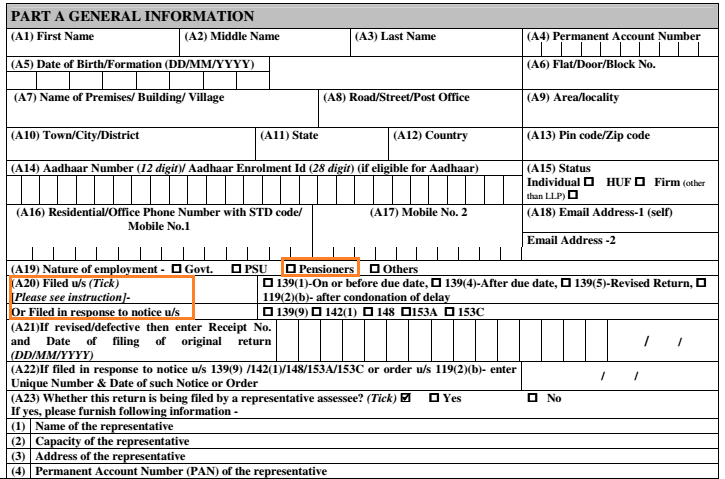 New fields under section 44AE has been introduced like Registration No. of goods carriage, Whether owned/leased/hired, Tonnage Capacity of goods carriage (in MT), No. of months for which goods carriage was owned/leased/hired by assessee etc. 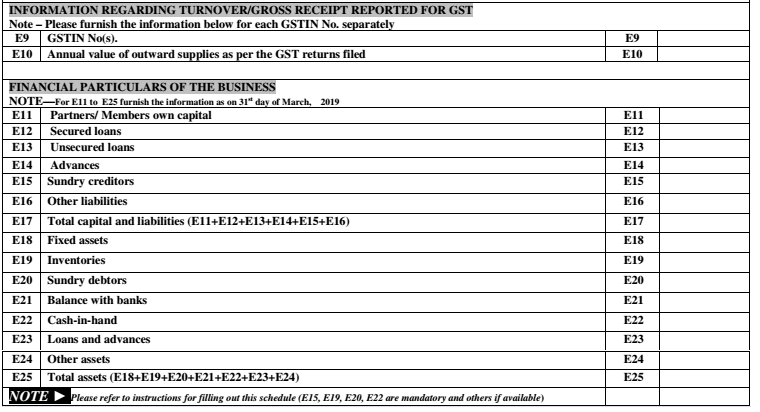 Under GST details the turnover text has been replaced by “Annual value of outward supplies as per the GST returns filed”. ‘Deemed to be let out property’ option now available under ‘Income from house property’. The taxpayers will be required to provide income wise detailed information under the ‘Income from other sources’. A separate column is introduced under ‘Income from other sources’ for deduction u/s 57(iia) – in case of family pension income. Section 80TTB column has been included for senior citizens. When you are running a small business, you may not have enough resources to maintain proper accounting information and calculate your profit or loss. This makes it difficult to keep track of your income and taxes from such a business. With this in mind, the Income Tax Department has laid out some simple provisions, where your income is assumed based on the gross receipts of your business. This method is called the presumptive method, where tax is paid on an estimated basis. a. Your Net Income is estimated to be 8% of the gross receipts of your business. But From FY 2016-17 onwards, if gross receipts are received through a digital mode of payment, then Net Income is estimated at 6% of such gross receipts and for cash receipts. However, the rate is the same at 8% of such cash receipts. b. You don’t have to maintain books of accounts of this business. c. You have to pay 100% Advance Tax by 15th March for such a business. No need to comply with the requirement of quarterly instalments due dates (June, sep, Dec) of advance tax. d. You are not allowed to deduct any business expenses against the income. If you are running more than 1 business, the scheme has to be chosen for each business. For example, if you run 3 businesses where only 1 is assessed under section 44AD. The relief of not maintaining accounting records & no requirement of an audit is only applicable to the business to which this scheme applies. For other 2 businesses which are not covered under this section – the accounting records have to be maintained and audit is also required. Similarly, in case of Advance Tax, the benefit of paying the advance tax in one instalment by 15th March is only granted for the business for which this scheme has been opted for. If the taxpayer has income which is other than from such business, where his tax liability exceeds Rs 10,000 in a year, he has to pay advance tax on such other income. a. Your gross receipts or turnover of the business for which you want to avail this scheme should be less than Rs 2 crore. b. You must be a Resident in India. c. This scheme is allowed to an individual, a HUF or a partnership firm. It is not available to a Company. d. The scheme cannot be adopted by the taxpayer, if he has claimed deduction under section 10, 10A, 10B, Section 10BA, or Section 80HH to 80RRB in the relevant year. d. Professionals – who are carrying on a profession of legal, medical, engineering, architectural, accountancy, technical consultancy, interior decoration, an authorized representative, film artist, company secretary and information technology. Authorized representative means – any person, who represents someone, for a fee or remuneration, before any Tribunal or authority under any law. Film Artist includes a producer, actor, cameraman, director, music director, art director, dance director, editor, singer, lyricist, story writer, screenplay writer, dialogue writer, dress designer – basically any person who is involved in his professional capacity in the production of a film. (see Sec 44ADA). These are the professions listed under section 44AA(1). Devesh runs a medical shop in his colony. The receipts of his business are Rs 1,50,00,000 in the financial year 2018-19. Can Devesh take benefit of the scheme under section 44AD? No business expenses are allowed to be deducted from the net income. Depreciation is also not deductible. However, in case of a partnership firm, a separate deduction for remuneration of partners and interest paid to partners is allowed. This must be within the limit specified under section 40(b). Even though depreciation is not allowed as a deduction, written down value (WDV) of the assets shall be considered as if depreciation has been allowed. For example, Rohit runs a Kirana shop and his gross receipts are Rs 75,12,260 from this business. He decided to opt for the scheme under section 44AD. He also wants to claim depreciation for 1 large refrigerator and a computer with billing system he purchased for Rs 2,50,500. He also spent Rs 1,50,000 buying new racks for displaying his goods. Can the taxpayer declare higher or lower income than 8% of gross receipts? The taxpayer can voluntarily declare a higher income and pay tax on it. In case the taxpayer chooses to declare lower income than 8% of gross receipts – he shall have to maintain books of accounts and get them audited. For example, Ritesh runs a stationary shop and his turnover from this business are Rs 85,20,000. He wants to opt for the scheme under section 44AD and therefore his income shall be Rs 6,81,600 (at 8% of gross receipts, assuming all cash receipts). However, Ritesh’s actual income from the business works out to Rs 5,74,000. Ritesh decides to not opt for the scheme under section 44AD and pay tax on the actual income of his business. However, since he’s not opting for this scheme he has to maintain proper accounting records and also get his records audited. Computing Turnover or Gross Receipts : Gross receipts or Turnover mean the total collections of the business. The receipts shall be inclusive of GST. The receipts shall also include delivery charges as well as receipts from the sale of scrap. For those who are in the business of plying, leasing or hiring of trucks a scheme similar to presumptive income scheme under section 44AD is available. You should be in the business of plying, leasing or hiring goods carriages. 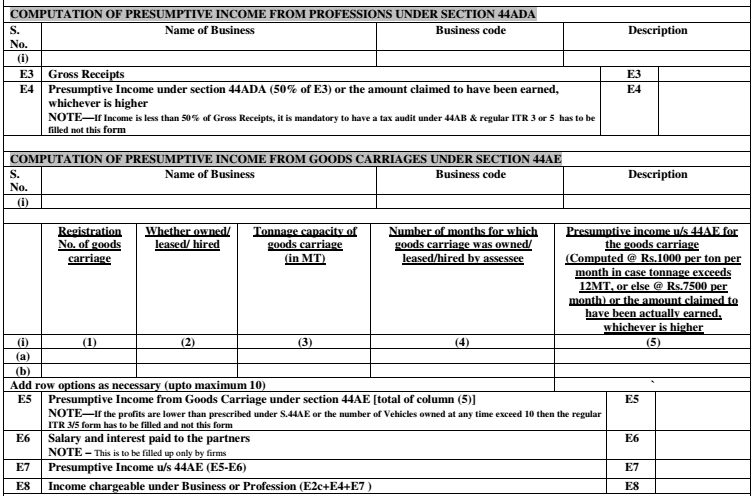 Net taxable income from a goods vehicle (including any goods carriage) will be calculated as Rs 7,500 per month for each vehicle per month or part thereof during the FY in which vehicle is owned by the assessee. The above calculation will be irrespective of heavy goods vehicle (more than 12000 kgs) and light goods vehicle(less than or equal to 12000 kgs). The advance tax has to be paid 100% by 15th March for such businesses. No need to comply with the requirement of quarterly instalments due dates (June, Sep, Dec) of advance tax. No business expenses are allowed to be deducted from the net income. Depreciation is also not deductible. However, in case of a partnership firm, a separate deduction for remuneration of partners and interest paid to partners is allowed. This must be within the limit specified under section 40(b). Even though depreciation is not allowed as a deduction written down value (WDV) of the assets shall be considered as if depreciation has been allowed. Can the taxpayer declare higher or lower income? The taxpayer can voluntarily declare a higher income and pay tax on it. In case the taxpayer chooses to declare lower income than as mentioned above – he shall have to maintain books of accounts under section 44AA and get them audited. The benefit of Presumptive tax rates was only available to businesses. But now this benefit has been extended to professionals also. It will be applicable to the professionals, whose total gross receipts does not exceed Rs 50 lakhs in a financial year. The scheme is applicable only to a resident assessee, who is an individual, HUF or Partnership and not LLP (Limited Liability Partnership Firm). No requirement of Maintenance of books of Account: Professionals opting for this scheme need not maintain books of account required under section 44AA. They also need not get the books of account get audited under section 44AB. Deduction for Business Expenses: No business expense is allowed to be deducted from the net income. Depreciation is also not deductible. Even though depreciation is not allowed as a deduction. Written down value (WDV) of the assets shall be considered as if depreciation has been allowed. Can the taxpayer declare higher or lower income? The taxpayer can voluntarily declare a higher income and pay tax on it. In case the taxpayer chooses to declare lower income than 50 % of the total gross receipts- he shall have to maintain books of accounts under 44AA and get them audited. Are you a Freelancer and need help with filing your ITR-4? Do you need to file ITR-4?